Adrien Jean Le Mayeur de Merprès was active/lived in Belgium, Indonesia. Adrien Le Mayeur de Merpres is known for impressionist landscape, portrait and figure painting. 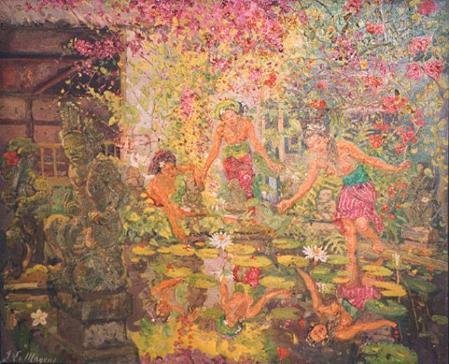 Seller's Notes/Description: Adrien-Jean Le Mayeur de Merprès (Belgian, 1880-1958) Balinese Women by a Pond in the Garden of Sanur signed 'J le Mayeur' (lower right) oil on canvas, in an original hand carved Balinese frame designed by the artist 55 x 66 cm. SOLD by Geringer Art.